Getting your wedding featured on a blog or in a magazine does not mean your wedding is better than anyone else’s. If you don’t get your wedding featured in a blog or magazine (or if you try to submit for feature and get rejected), it does not mean your wedding was less special than anyone else’s wedding that was featured. I’ve been featured several times. I used to also intern for publications and even held a job that focused on selling stories, and I worked on the blogging side of things where I was the one accepting submissions, so I know what editors are looking for, what works for publication and what gets eyes on a story. Let me tell you a little secret about publications, blogs, magazines and newspapers: they are all about exclusivity and being the first to do anything. It’s all about traffic and clicks. Let me tell you another little secret that might be a little blunt but it’s important to keep in mind: most weddings are the same. They follow the same repeated trends, colors, traditions, and incorporated details. It’s very very hard to make a wedding totally unique. It’s even harder to get your wedding featured somewhere. There are no guarantees to what will and won’t be picked up for publication. But I can give you a few tips while planning that can help increase the odds of getting your wedding to go viral. The very first step to getting featured is to be unique. In the world of wedding features, it’s more about unique, personalized details rather than what you’ve seen be successful before. If it sounds cool or unique and you found it on Pinterest, more than likely editors have “been there seen that” and it’s thrown away as being cliche or trend. Think: donut walls, mason jars, candy stations, and repeat color palettes like blush and gold. Stop looking at Pinterest right now: all the weddings you see on Pinterest have already been featured, and thus if you take inspiration or recreate anything you see on Pinterest, it has less of a chance of being featured unless you take that idea and turn it into something 100% unique (like, make a donut sculpture that is displayed instead of an ice sculpture or a donut wall). Wedding details matter more to editors than anything else. The whole point of a wedding blog is to help couples plan their wedding. It’s not really about you. It’s about the work you did, what you added/included, and how you pulled it all off. So, it’s all fine and dandy that you bought the most expensive designer wedding dress you could find, but more than likely the thing that will get you featured are the unique, eye-catching centerpieces you chose, the way your venue looks, or the funny signage you put up pointing to the bathroom. Most of the time (not always), money matters. It’s very rare that a completely DIY budget wedding is featured on a wedding blog. I hate to say that; my wedding was a budget wedding and it was the most fun day of my life. And I still hear my guests tell me they had more fun at my wedding than any other wedding they’ve been to. I wouldn’t have changed it for anything in the world. BUT it wasn’t a priority of mine to get my wedding published. If you want to see your wedding on a blog, you will need to spend the money. Hire a planner that helps you bring your vision to life, preferably one who knows how a wedding should be designed in addition to how the day should flow. Be prepared to spend money on florals, rentals, and details that really WOW people. Whatever you think your budget is, the weddings you see featured on blogs could easily have cost twice that. Now, another disclaimer: even if you spent upwards of $100k on a wedding, throwing money at a wedding alone will not make or break your chances at being published. So, take this word of advice with a grain of salt. It’s more important to be unique than to be expensive. What you look like is almost as important as what the wedding looks like. This part is a little politically correct and a hard truth: Editors take into account not only how a wedding looks, but how a couple looks. If you are a unique looking couple, that can be as much of an asset to getting your wedding featured as a unique venue or details. Very few blogs and publications want to feature perfect, model-like couples. They want their featured weddings to feel REAL, not staged. And that includes featuring what they consider real, all-inclusive couples of all shapes, colors, and sizes. If you love video games, have some video game references. If you’re big on bold colors, include them all. If your favorite hobby is riding bikes, ride down the aisle on a bicycle built for two. Think outside the box when it comes to any and all aspects of your wedding. Choose vendors who have a portfolio that meshes with your personality. Hire a team that “gets” your vision. This is probably the best piece of advice i can give you. Everyone that’s involved in the wedding planning process is going to give you their opinion on something you plan to include. If they tell you they’ve never seen that done at a wedding, it’s probably a good sign to favor the odds of the wedding being featured somewhere. Be weird. Include inside jokes, homages to life events, and hints at your personality or story as a couple. There really are no wrong ways to do this, as long as you’re being true to yourself as a couple. Hire the best photographer you can find. Don’t roll your eyes; This is important. A cost-effective, inexperienced photographer can make an expensive wedding look cheap. Conversely, an experienced wedding photographer with a stellar portfolio can make even the most budget of weddings look expensive. I can’t emphasize the importance of this enough, and even though I’m a bit biased, it’s very relevant. If you want to be featured, hire someone who knows what they’re doing with a camera. Submit somewhere that matches your style. 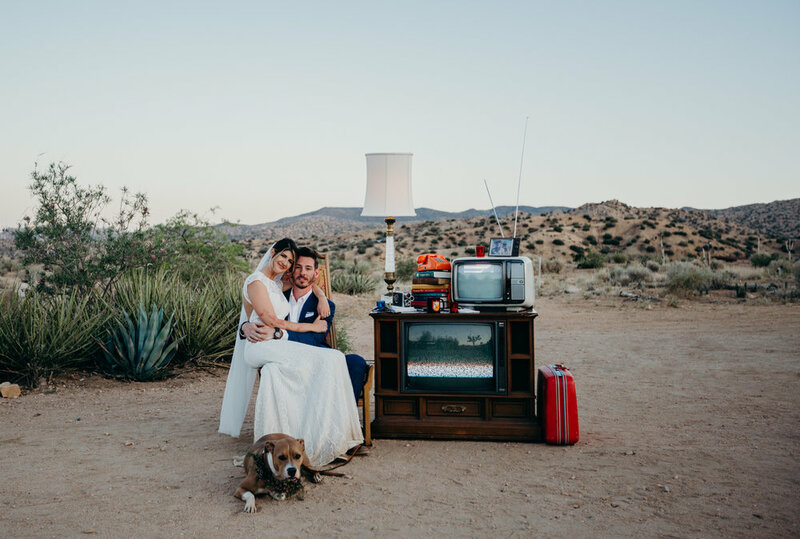 Another really important tip for getting published: If all the weddings on a blog you like features outdoor, earthy, bohemian weddings, it’s unlikely your traditional, classic hotel wedding will grace the pages. Stick to what is most likely to pick your wedding up. Find a blog that matches your style and has the same type of vibe you are going for. And it helps to know what wedding blogs are the most popular, and therefore least likely to feature you since there is more competition to getting accepted. Like I mentioned above, none of these things guarantee a feature. I’ve shot so many weddings and only about 1% of them have been featured anywhere. It takes a lot of time and consideration to even submit a wedding somewhere, and every blog/magazine has their own requirements for how they want to receive submissions. There are so many blogs on the internet, it’s likely you can find somewhere that will feature your wedding if you really want it to be published. Make a list of 10 blogs, ask your photographer for other suggestions, and keep at it. If you hear one no, move on to the next blog until you get a yes. When there is a will, there is usually a way.